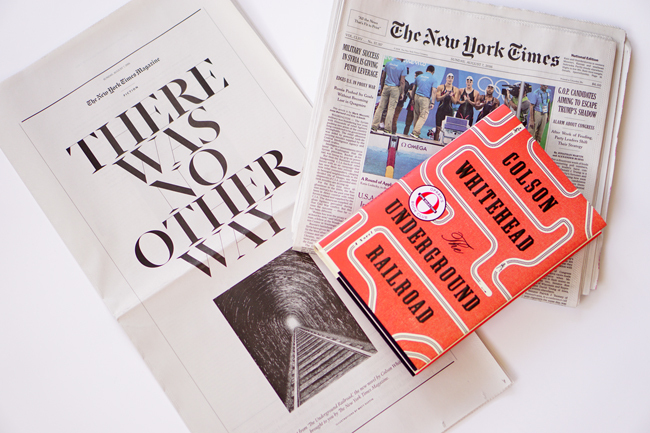 Today, in print-only format, The New York Times ran an excerpt from Colson Whitehead's newest novel The Underground Railroad. The production offers a rare analog version of writing in a newspaper at a time when most venues privilege digital publications. The 16,000-word excerpt from The Underground Railroad was planned well in advance of the news early last week that Whitehead's novel was selected as a selection for Oprah Winfrey's book club. One fascinating aspect of Whitehead's novel concerns the fact that he presents the underground railroad as an actual underground series of tunnels designed to facilitate the escape of enslaved people. Those tunnels are visually referenced in the central opening image of the standalone excerpt, which depicts a tunnel with railway tracks.